Just days after arriving home from a very unique motorcycling adventure, creator of Miles By Motorcycle, Bob’s good friend and long time customer, Yermo Lamers stopped by grinning ear to ear to fill us in on the details of the exciting trip he had just returned home from. 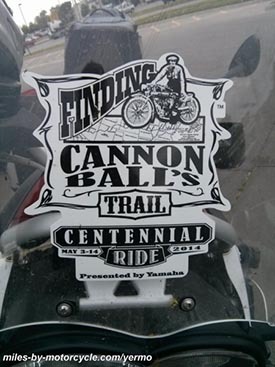 By mere coincidence, Yermo found himself joining an industry invite-only ride that had been in the planning for the past 3 years and that will forever be noted in motorcycling history, Cannonball’s Trail Centennial Ride. While we could pass along the stories shared with us via this newsletter and drop names of all the motorcycling legends he rode with, it would be a disservice to both you and Yermo, which is why we invited Yermo to host a Saturday session at Bob’s BMW so you can personally hear all about the adventure straight from the horse’s mouth. Where he found himself along the way like being guided by police and fire escorts past waiving spectators, and attending receptions planning specifically for this group of riders, as well as the many stops made along the original Cannon-Ball Baker route.View Images. And finally, why taking chances in life, not just when motorcycling, is important. Plus some other valuable insight gathered along this amazing journey.